B2B Technology adoption is far slower and this defines the Tech companies success predominantly. A Few years ago, one of my contacts referred me a book “Crossing the Chasm” by Geoffrey Moore, where I learned about the personality traits of people who adopt tech. 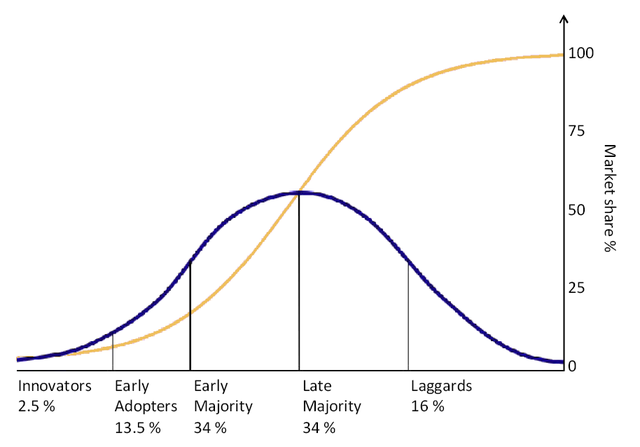 Innovators, Early Adopters, Early Majority, Late Majority, and Laggards. The basic understanding of tech adoption and the personality traits play a major role when we design and position the product. Majority of the disruptive products(AWS, Salesforce, Tesla, even Intercom) who aim to challenge the status quo will focus on bringing the tech to Early adopters. 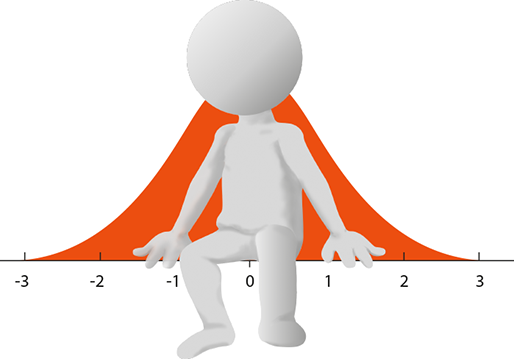 The Early Adopter segments will understand problem well and able to relate to it when we pitch a solution for them. This segment will also have money, and ready to pay as well as experiment, it’s easier to build businesses around these segments as the paying capacity and LTV, would be much higher. Then you’ve Early Majority, Late Majority and Laggards makes another 50% of the market, however, building a business around these segments is hard and needs a different understanding of the users. Why we cannot build more businesses for the Rich. Because of TAM (Total Addressable Market). When you focus on the top rich segments, only a few companies can co-exist, perhaps a 10 may be. It’s an apple to apple competition, i.e. mostly same features, not well defined USPs and companies cannibalising each others market share. The market will have a clear leader and the others who follow the leader. Example: Intercom and Drift. I see no big difference between both of them, we all know Intercom is winning the market, however, Drift playing around a lot of marketing, literally crazy marketing. The companies which focus on top segments cannot bring the bottom 50% onboard, as it requires a whole different process and understanding. The bottom 50% adoption would be slower because you’d need to educate them with the problem first, and the same solution which companies have created for the top segment will not work because the bottom 50% work with a lot of constraints and they’d need a much easier workflow as well as tools which satisfy their needs. We’ve been working on our product for a long time (three years), a lot of experiments, failures and one success. After building our product we were trying various things to get the word out, yet we didn’t try anything religiously because we didn’t know how to do it. We read an article, we try to execute it. Another article and we try to execute it, lack of experience, lack of knowledge, lack of network made us go spiral on the same path. Start -> Try -> Drop -> Start -> Try -> Drop, and the vicious circle continued for really a long time. The Results, we couldn’t even achieve a two digit sales over 6 months. My team motivation was at it’s low, I was a walking Zombie who was refusing to die and give up. We were providing services, consulting gigs to pay salaries. Our skills were in funnel optimisation and conversion (We did not had enough visitors on the site to convert them), we were paid ad experts — with no money to pay for the ads. Raising money was also not an option because we didn’t have any background, neither a solid educational degree, nor a product which was targeting the early adopters. We decided to launch on Appsumo, I personally think this was the first time we charted a plan and executed it very well. Then, we have had a few hiccups but overcame them very quick. During the launch time period, we’ve had zero bugs reported, our systems scaled horizontally (Our dedicated average engineers built it and they can build great products given the right motivation). The efforts we put on to fine tune the product over one year improved our quality, and we were able to deliver what we promised. Users started testing it, feeding us back with their inputs, and the conversations started. I personally handled 60–70% of the support requests, round the clock which I think gave me insights very deep about the ignored market. When I started talking to them, understanding more about them, how they are being influenced, by every company who wants to get a pie of them and create an illusion around them to sell their solutions. Top companies simply ignore them, they expect them to a reach certain level, else they don’t bother to hand hold them — have you heard of the term, unqualified lead? — Mostly it means, not worth it. I could relate myself with many of the digital marketers, most of them are in the same vicious circle as we were and trying to identify and do many things on their own. a) Single person or a small team of people trying to get the work done for the company / agency. b) Serious lack of access to resources — Developers, Analysts, Designers. So everyone had the motivation to learn more and get work done by themselves. c) Thin budgets, and that is being targeted by many. They wanted to optimise their spends, reduce their costs. d) Lack of serious knowledge on processes as well as skills. The more I spoke with people, the more I was able to relate myself with them. They started helping me, giving me suggestions on how to improve our website, spent time motivating me, and they become friends. I was on a cross path, to make a decision on which route I should take, the top or the bottom segment. At the back of my mind, I had grown a strong connection with the bottom segment, may be because I’m one of them, The Average. Spent the last four weeks, understanding deeper, learning about the businesses which focussed on the bottom segments, and crafted a plan. Build products which will help the averages adopt, learn and deliver results faster. We wanted to focus on their learning, build and dedicate the company for them. Right now, our product Action Recorder (A no-coding alternative to Google Tag Manager) is being adopted slowly, I thought this was the simplest solution to track the user behavior on the website but we need to make it much simpler so that the product adoption will become easier for our customers. A lot of focus on design, makes it easier for digital marketer to adopt the solution faster. Dedicated mentorship channel, right now we are hiring our product marketer role and I don’t want them to market our product rather I want them to mentor our customers. A methodical learning platform for our customers — I’m a firm believer of methodical learning, and this the only way to set a process which will force the users to learn and excel. I realised we need more funds and I approached a investor a couple of weeks ago asking for an investment because the above needs more efforts, research, and processes but they refused saying this won’t work. Back of my mind, I said to myself We are “The Average”, we have to prove it and they believe it. If you are one of the 1500 customers started the journey with us, we are in this together and we always got your back. PS: We’ll be sharing a lot of learnings in this channel, if you wish to share yours to the world leave a comment, I’ll get in touch with you.